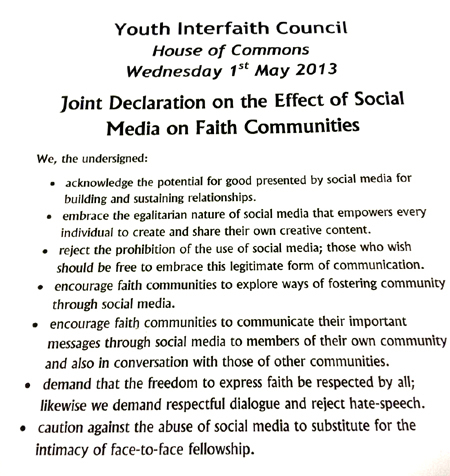 "It's true Jesus didn't use twitter but that doesn't mean we shouldn't", said Daniella Duvall, the Christian youth contributor to the Youth Interfaith Council that met last night to consider the 'Impact of Social Media on Faith Communities'. 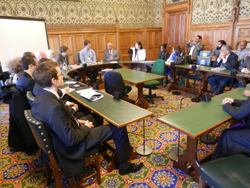 The event was hosted by Universal Peace Federation (UPF) -UK's Patron, Mr Virendra Sharma MP. He praised UPF for its work for community cohesion. He was especially pleased to see young people taking the stage for this event. There were prepared speeches from Christian, Muslim and Unificationist perspectives followed by a good discussion. A presentation by Ilaria Esposito who is on the Advisory Council for Youth on the Council of Europe, focussed on the 'No Hate-Speech Online Movement'. The event started with Matthew Huish (Main YIC Coordinator) explaining that the event Hashtag was #yicsocialmedia. He continued to speak on the vision of UPF and its main goal, the reformation of the United Nations to include an upper chamber of world level respected faiths leaders who can comment on world affairs. Such a body would be a voice of conscience and a moral, religious platform where a variety of faith traditions with their sources of wisdom can influence policy making. The goal of UPF is to allow those voices-and wisdom to affect policy. During the programme a presentation by Ilaria Esposito who is on the Advisory Council for Youth on the Council of Europe, focussed on the 'No Hate-Speech Online Movement'. Hopefully he wishes people can be inspired to see how valuable this contribution can be. As, we currently don’t have such a council to draw an example from, we get together young people of faith who are informed in their own traditions, theologies and teaching, and they are using that scriptural wisdom to deliver statements and speeches commenting on various themes. We bring together a variety of faith communities, to speak about current relevant issues of today. We can discuss then demonstrate to public at large joint statements and declarations to inspire the population to have confidence in this project and idea. This can translate itself to a more senior council with members of various faith communities. Daniella Duvall, a Theology and Religious Studies student spoke from a Christian perspective. She looked to her own experiences after google and twitter. The Church is a community and social networking allows an extension that wasn't possible 10-20 years ago. Her mother highlighted issues she had overlooked such as intimacy. Bible reminds us that God is everywhere, but can HE be online? Is there an online equivalent of Jesus’ significance. People can become obsessed with likes and it can astray us from actual mission. It is hence important not to lose sight of what Christianity is all about. We must not oversimplify it and allow ourselves to become caught up with number of followers and likes. Asmah Zuriman, PhD Religious Studies student from University College London described the impact of social media on religious communities from an Islamic perspective. She explained that in the years, they have seen many good initiatives, blogs, websites, online libraries to collect information and communicate views. The interactive part is important not just about receiving but also about giving information. engagements are not solely aimed at Muslims but are interreligious & help to foster better relations between cultures. She also shed light on negatives: Social media can also function as a weapon for those who want to inflict harm. There are sites designed to set people against each other. Two main groups relevant in this context: those with deep hatred to Muslims such as Anti Muslim Islam Alliance and from within Muslim community. Both are extreme and radical in their views. Such groups abuse social media’s facilities. Asuka Ohagi-Ostberg, who is studying Religion at Kings College London, spoke for the Family Federation for World Peace and Unification (Unification Church). She started by giving a quick introduction to the religion including how and when it had started. She continued, stating that being relatively new, the media had been very interested in it. Mass weddings and brainwashing stories form much of the early news articles. This, she clearly explained, is because the media is interested in what is sensational, outrageous and promotes sales. With the emergence of social media each of us can become the media ourselves. Many people have set up YouTube channels, conveying messages to people around the world. It is hence our task to explore and find ways to deal with social media. The event continued with a 'Q and A' session as well as sharing from the audience. Christa Kamga (one of the YouthUPF co-ordinators) said she sees Facebook, & other social media, as an easy way both to contact people and find those who are interested in similar activities. It was easier to create events and contact organizations, through social media. She was followed by Amit Sharma from the Hindu community, who expressed that she 'found loads of groups with different members' through social media. She also appreciated social media as is it provides a platform to like and/or share. An issue can be that some of the community do not do much else. A great contributor was Ilaria Esposito, she spoke about social media and the online campaign against 'Hate Speech'. The 'No Hate Speech Movement' has provoked a big discussion on social media among young people. Farah Mohammoud, was previously part of a similar group. She mentioned unheard voices. How can we tap into those unheard voices? That is why these types of forums are important. Key individuals should be able to say, “I’m going to help pass this message on”. One good point of social media as Shabnam Khan pointed out, is that there will be different opinions from different faiths. Each perspective will allow you to see things in a different way. The event, shed more light on the positive aspects of social media as Mr Sharma MP had said in beginning. It provides a platform to bring together the generations. The 'No Hate Speech' campaign and the regulation of the right to freedom of expression by imposing legal limitations regarding what can be said online about faith is one that requires a great deal of debate and discussion? There is so much social media information on the internet that it is difficult to identify reliable sources. Now we know Facebook will not be source of information but rather be a hub. We can be part of the media ourselves. We should be really active. A comment from the audience, requested us to find ways to get celebrities involved so that the YIC can quickly be known worldwide.